A sudden gust of wind brushed the curtains aside, setting the candles on the dresses quivering, and sweeping around the feather into the centre of the star. It swirled to a halt, quill towards Emma. At the same time, the candle representing ‘Fire’ flared up, and the door rattled in its frame. Emma is delighted when her Dad falls in love and proposes – until she realises that this means that Pip will be her stepsister. Emma and Pip do not see eye to eye about anything, and now they are going to be living together! Things don’t improve after the wedding, with Pip doing everything she can to make Emma’s life difficult. Then, when she drags Emma into her attempts to cast magic spells, something strange happens – it is Emma who can suddenly do magic. Emma has never wanted to be a witch, but there doesn’t seem to be any way to reverse the spell. In the meantime, can she use her powers to change the status quo? Wyrd traces the challenges of blended families, friendship and bullying, in a story which uses just a touch of fantasy, with Pip’s fascination for magic seemingly unproductive until well into the story. Young readers will enjoy the challenges and moral dilemmas which Emma’s new skills create. Suitable for middle primary aged readers. ‘Patty, have you ever thought about playing basketball?’ Coach Clarke asked. ‘I’d like you to try out,’ he said. ‘Would I get to play on the ball for the whole game?’ I asked him. Patty loves sport, but he’s never played basketball before. Still, he’s good at every other sport he plays, and his uncle Danny is a great basketballer, so he expects to be a great basketballer straight away. He soon discovers there more to the game than just shooting hoops. Patty Hits the Court and Patty and the Shadows are the first two books in the new Game Day series written by Australian basketball sensation Patty Mills, together with author Jared Thomas. Perfect for sports mad readers, the books tell high interest stories, as well as showing children from Aboriginal and Torres Straight Islanders engaged in every day life, including school, sport and family life, as well as partaking in cultural events such as Mabo Day. This blend is really important for all Australian children. Patty is a likable main character, who doesn’t always get everything right. He has to learn, for example, to share the ball, and to overcome bullying and difficulties with school work, topics which make him relatable for young readers. First day back from school holidays and today in English, Mr Granger discussed the power of writing. He explained how the pen is mightier than the sword and gave examples of how writing influenced people to change. He said words can be so powerful that if you really want a wish to come true, then the best way to make it happen is to write it down. To prove his point, he has set us a whole-term writing assignment where we have to write down a heap of wishes and explain why we really want them to come true. Then we have to document the exact circumstances of when each wish is granted. I really like Mr Granger, and English is by far my favourite subject (I even want to be a writer when I grow up), but I am wondering whether he has lost the plot a bit with this one! Harry Kruise is doing it tough. He’s the shortest kid at school, his dad is not around and his mum takes in boarders, old blokes, who mostly stay in their room. At school, he’s the frequent victim of bullying, mostly from Brick. A dog would help, if only his mother would allow him to have one. It would mean he’d finally have a friend. Then old man and master storyteller, Jack Ellis, moves into the shed. Jack is full of stories, lots of them about dogs. Slowly, slowly Jack’s life begins to change. Mr Granger has told him and his classmates that wishes will come true if you really want them to, and set the class an assignment that will last the entire term. Told in online diary entries, dog tales and wishes, Harry reveals his life, his dreams, his fears. He’s thirteen years old, Term 4 of his first year of secondary school has just begun and he’s not having a lot of fun. He’s seeing the school psychologist every week. He’s also full of fear. If his father can leave like he did, Harry is sure nothing else in his life will ever secure. There are themes around loss, bullying, family and more. By the end of the term though, Harry has stopped sinking and starting to swim. Told with humour and including great Australian yarns, ‘Harry Kruize, Born to Lose’ offers short chapters and clearly marked viewpoint changes. Recommended for upper primary readers. all alone in the dry grass. ‘Let’s play,’ said the wind. The wind whistled and gently picked me up. Spark is the story of a wild fire, told from the perspective of elemental fire. It begins as a spark, and in answer to a question from the wind, the two begin to play. The ‘play’ escalates as the fire and wind race across the land until the fire acknowledges the destruction and wants to end the game. The wind continues until together, they turn on their path and witness the cost of the play. Illustrations are painted and progress from summer sunny through bright flame to black and greys to finish with the tiniest glimmer of colour. Text is hand-drawn by illustrator Andrew Plant. Image frames grow with the intensity of the fire and retreat as it does. Image frames set in smoky pages. Spark is the story of the consequences of a single careless incident. There’s a sense of menace from the front cover on, hands-over-the-eyes please-don’t-let-this-happen inevitability. What starts small quickly builds out of control, with no time to see the damage. Bit like bullying really. Suggested reading age is pre-school but it will have applications well beyond preschool, particularly in the classroom. Illustrations provide the opportunity to search out beetles, ants and larger animals as fire chases all before it. Recommended for early primary and for inclusion in discussions about both fire and bullying. ’This is it. The beginning of our new lives. Ready? They stepped into the cheers and music and beneath flying streamers and confetti. All around them were people in tears, hugging and laughing. War rages across Europe, and Teresa and her family endure tough times in their homeland, Malta. There are bombing raids every day, and her father is away fighting alongside the allies. Even when peace finally comes, life is difficult, so Teresa’s family make a difficult decision – they will leave Malta and start a new life in Australia. In Australia life is safer, and Teresa’s parents find jobs, but there are still many obstacles to overcome, including getting used to Australian ways. 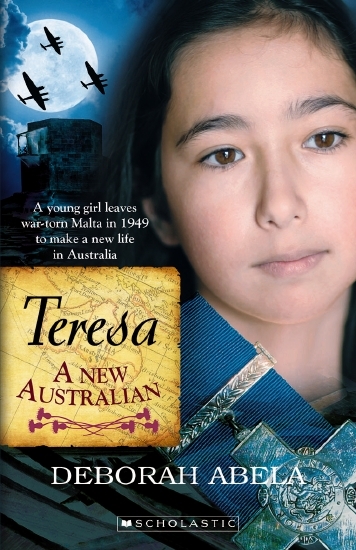 Not everyone is welcoming of new Australians, but Teresa is determined to succeed in this strange new land. Teresa: A New Australian is wonderful new historical fiction, exploring the life of one new migrant in the years following World War 11. Teresa is a feisty, loyal girl who faces each new challenge head on. Readers will enjoy getting to know her and at the same time will become familiar with aspects of Australia’s history they may not know. Teresa is an outstanding addition to the New Australian series.